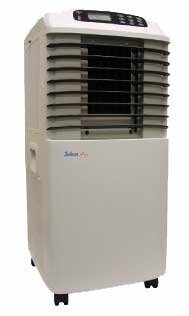 9000 BTU portable air conditioner with combination 7000 BTU electric heater. I GOT THIS BECAUSE MY PERMANENT THRU THE WALL UNIT SUPPLIED BY MY LANDLORD HAD DIED. I BOUGHT IT FROM A FRIEND SLIGHTLY USED AND IT'S ONE OF THE BEST INVESTMENTS I EVER MADE. IN SWELTERING 90+ DEGREE DAYS IN STICKY-ICKY-NO-AIR MANHATTTAN THIS LITTLE GUY COOLS OFF ABOUT 500SF BEAUTIFULLY! MY FAVORITE THING IS THE SWINGING FAN FEATURE SO THAT THE ROOM IS COOLED EQUALLY. AND YOU CAN DIRECT THE LARGE BLADES ANYWHERE. THE ONLY DOWN SIDE IS EMPTYING THE WATER CONTAINER ABOUT EVERY 5 HOURS WHEN IT'S REALLY HOT. OTHERWISE - I LOVE IT BETTER THAN MOUNTED ONES.